I decided this afternoon to head down to Cottesloe Beach again despite the heavy rain and huge seas slamming into the groyne. I always knew that I was going to get soaked so I just wore an old jumper, shorts and put my camera into an underwater housing. I’m glad I did, here is a shot of me just about to be soaked with the spray of a wave hitting the groyne. It was heaps of fun though the few people who were there looked at me as if I was crazy. Yes I did get soaked form head to toe. To be honest it was pretty uplifting being sprayed by the ocean, like new life was being splashed onto me. Hope you guys enjoy this photo of Cottesloe Beach. This entry was posted in australian landscape photography, australian seascape photography and tagged australian landscape photography, australian seascape photography, black and white, cottesloe beach, cottesloe groyne, landscape photography, ocean, perth, seascape photography, seascapes, waves, western australia. A bit like me this morning Jamie…getting the shots of the Austal Tri on the rocks..only my soaking was from the rain! Yes I saw your shots. Pretty cool. Not for the owners though I guess. I was down at Cott earlier on today, around 1.30pm. Didn’t get any decent photos, but did get soaked a couple of times. I was trying to capture some of the waves crashing and didn’t see one wave coming at me pretty quick. I couldn’t run back quick enough and ended up with soggy jeans, shoes and socks. I like the contrast in this photo, besides the actual wave. It looks a but flat. You could maybe do some dodging/burning on the wave to give it some more depth and contrast? Looks like there were a lot more surfers out while you were there – only 6 or so while I was shooting! Thanks for that. I’ll tinker with it a bit more. Should’ve given me a call. I’ll probably head back to Cottesloe again over the next few days. Austal are the owners Jamie…it is a spec boat! But there was not much damage fortunately! We are going out on sea trials in the morning Jamie and I am sure I could get you on board. The trials are endurance trials for 4-5 hours departing Austal Image at 0700 so if you want to meet me there at about 0645 we are on! I normally bring some lunch and a cup to make some tea…hot water on board. We could go out on a shoot as well sometime for sure. Let me know if you are coming in the morning. Yep I will be there for sure. Where do I meet you? Do i need any special PPE or are sneakers and jeans just fine? Meet me at the Gate of Austal Image at the South end of Clarence Beach Road. You should have steel caps, but I get away with business shoes. I’ve got steel caps so I’ll wear them. Definitely see you then. Man this is going to be some much fun! F*&k. My brother has the spare keys to the second car as he’s forgotten to drop them back off which means I can’t go, otherwise Melissa will have no car. Family!!!!!! Thanks for the invite any way mate. Still keen to catch up for a shoot though. Like Beau I would also like to see more detail/contrast in the waves splash. Also, I know it is cheating but I think it would be far stronger and less distracting if the lamp post suddenly just disappeared. Oh.. and while your at it can I get a dark figure walking down the groin carrying a black umbrella. Thanks. In all seriousness I think you’re onto something. 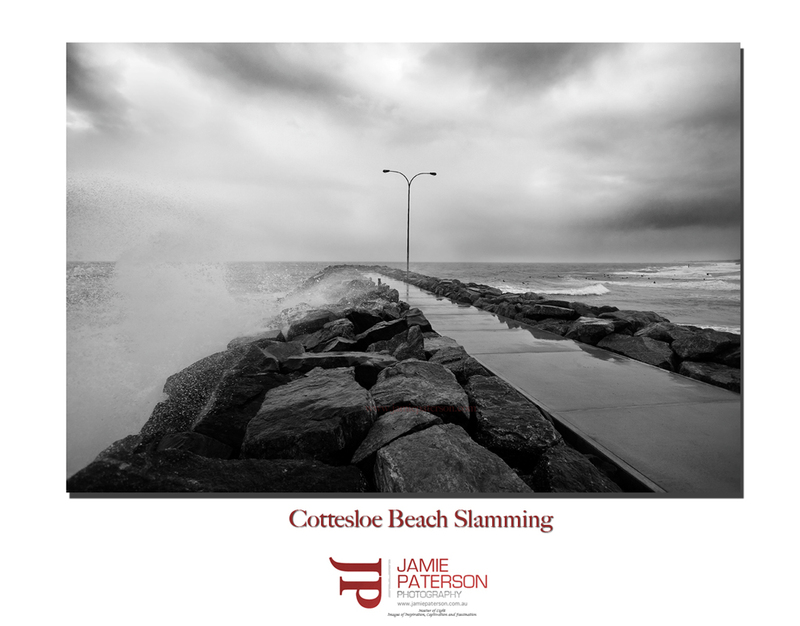 Protecting your camera with the housing and getting out there on a rugged/stormy day could yield some stunning B&W images. I was thinking about the lamp post maybe it could be a good test for the new content aware tool in CS5. This was more a learning / concept shot and we have some massive swell that is going to hit us on Thursday so I’m going to head out again and give it another go with my housing. It will be scary though as the rocks get really slippery and I did get knocked off my feet even with this medium sized swell. Actually it would be cool if someone would use my video camera to video me getting hammered next week by the waves on the Cottesloe Groyne.